In keeping with my Ten Minute Challenge, I figured I'd start with my Coastal 10-Miler. In mid-April, I ran the Coastal 10-Miler. It's a new race that fit right into my training calendar and I loved it! Ten miles is a great distance - it's not as fast as a 10k for me and not as long as a half marathon. The course was new (to me) and the cause - Victory Junction - was certainly worthwhile. I can't describe the joy and the excitement I felt after this race. I was proud - not of my result - but of how I ran the race. I walked for half a mile with the widest grin and a few fist pumps and even an "atta, girl!" for myself. I felt a lot of the same emotions that I felt as I crossed the line for last year's B2B. And boy, do I love that feeling! I felt great because I ran the race just as I had planned. I needed to negative split my pace - run the first five miles at 9:20 - 9:40/mile and increase my pace by five seconds for the last five. This is hard for me to do. I whine when I see progressive runs on my plan. I curse a little. I yell at my coach - oh wait, I'm my coach now. But I did yell at my coach last year for including them. Now I appreciate her wisdom. I started too fast but worked very hard to slow myself down. In the first half mile, I went from an 8:00 min/mile pace to 9:00 min/mile. Adrenaline and pride are the enemy of a great long run. I checked both of them in the first mile. I let a group of fast girls pass me and made myself stay behind two men that were working to stay at a 9:15 pace. 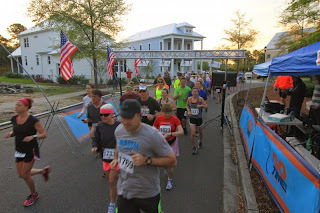 Coastal 10 Miler Finish from Colin Hackman on Vimeo.